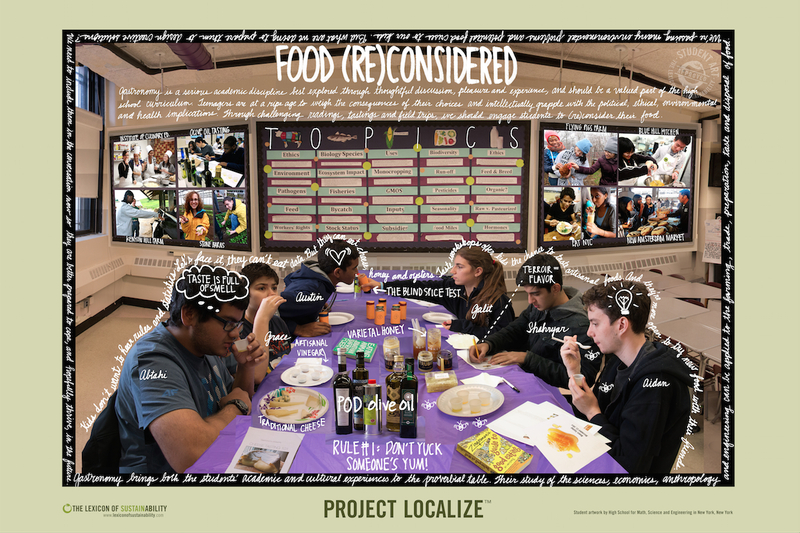 This past fall the HSMSE Gastronomy students participated in the Lexicon of Sustainability’s (LOS) pilot program called Project Localize. For those of you unfamiliar with LOS, founders Douglas Gayeton and Laura Howard-Gayeton create stunning, large scale information artwork composed of dozens of photos and the words of those they interview. 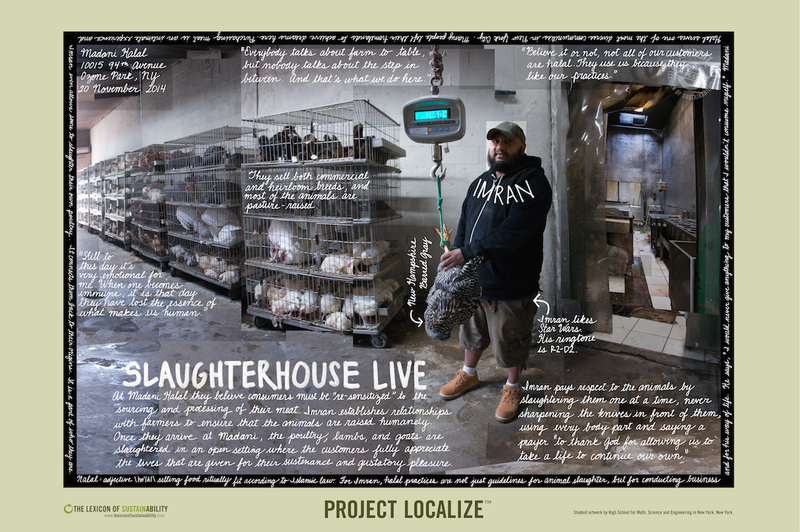 Each artwork tells the story of people who champion methods of sustainable food production and becomes a “term” in the growing lexicon of sustainability. Check out their incredible work here. 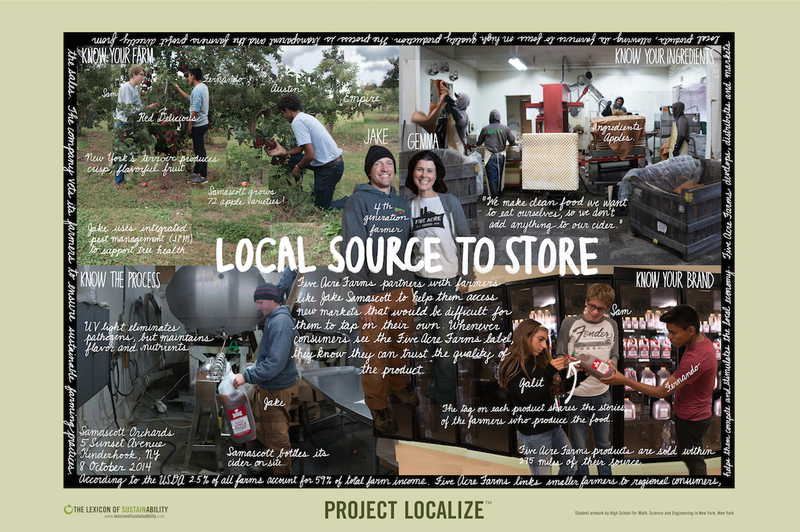 Last year, LOS piloted a program called Project Localize and they invited high school students from around the country to document the stories in their region, hoping that through the process, the kids would discover how complex the term “sustainability” really is. 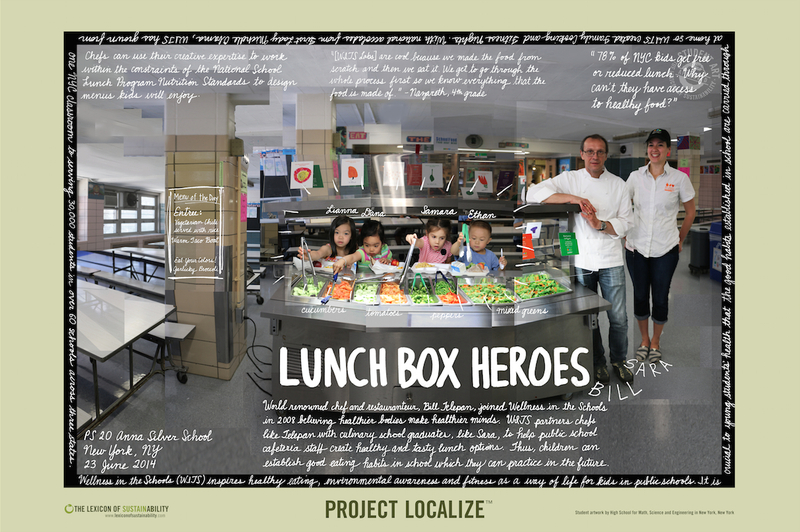 Our team was the only school in NYC to participate and we took the opportunity to investigate our unique and complex urban foodscape. So for our part, the MSE Gastronomy kids interviewed and photographed our five “subjects” and they photoshopped their little hearts out to compose the works. Once printed, each artwork will be around 4×6 feet, making it much easier to read all the fine print. But to help you out a bit, we included the main definition underneath each artwork below. At Madani Halal they believe consumers must be “re-sensitized” to the sourcing and processing of their meat. Imran establishes relationships with farmers to ensure that the animals are raised humanely. Once they arrive at Madani, the poultry, lambs, and goats are slaughtered in an open setting where the customers fully appreciate the lives that are given for their sustenance and gustatory pleasure. 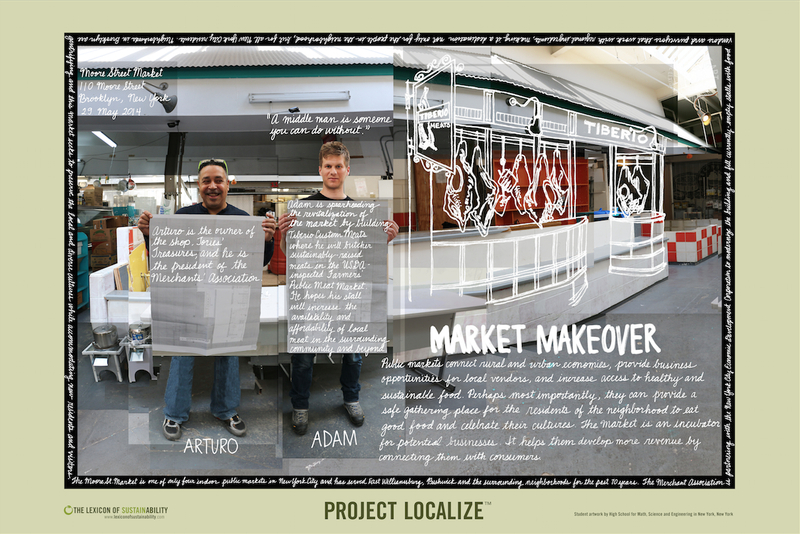 Public markets can connect rural and urban economies, provide business opportunities for local vendors, and increase access to healthy and sustainable food. Perhaps most importantly, they can provide a safe gathering place for residents of the neighborhood to eat good food and celebrate their cultures. The market is an incubator for potential businesses. It helps them develop more revenue by connecting them with consumers. We interviewed Adam Tiberio to learn more about his role in rebuilding the Moore Street Market, one of only four public markets in New York City. The kids met with chef, Bill Telepan, to learn more about the work he does with Wellness in the Schools (WITS). He joined WITS in 2008 believing healthier bodies make healthier minds. WITS partners chefs like Telepan with culinary school graduates like Sara to help public school cafeteria staff create healthy and tasty lunch options. Thus, children can establish good eating habits in school which they can practice in the future. Five Acre Farms partners with farmers like Jake Samascott to help them access new markets that would be difficult for them to tap on their own. Whenever consumers see the Five Acre Farms label, they know they can trust the quality of the product. We visited Jake to observe and participate in the sourcing and production of his cider in which his sustainably raised apples are the only ingredient. We decided to open the doors to our classroom to show that Gastronomy is a serious academic discipline best explored through thoughtful discussion, pleasure and experience, and should be a valued part of the high school curriculum. Teenagers are at a ripe age to weigh the consequences of their choices and intellectually grapple with the political, ethical, environmental and health implications. Through challenging readings, tastings, and field trips, we should engage students to (re)consider their food. ← The Kid Stays in the Kitchen: Galit Roasts the Turkey!